When God made the world, the most beautiful thing that he made for the human beings is relations around them. There is no doubt in the fact that no one can live and stand alone because it is really famous saying that even funeral needs 4 men. This clearly shows the importance of people, friends and relations around us. And when it comes to the relation that is purely and only for you and God makes it unique for every person is spouse. Yes! Marriage is a string that really connects two souls and tied them up for the life time and makes them responsible for each other. But this string is really delicate and any heavy wind of doubt or confusion can make this break into pieces. That is why showing love and respect towards your partner is the most important thing you can do to save your relation and couple. That is why romantic expression of love is really a need to save your relation. And when it comes to your husband than it is really important because when he comes home or when he is stuck in his work and facing a lot of pressure and deadlines then it is really a need that someone makes him feel love and pamper him like no one else can do it. And yes no one else can do it better than his own wife. That is why we are here to present you some romantic love messages for husband to make him feel special and absolutely awesome to have a wife like you. 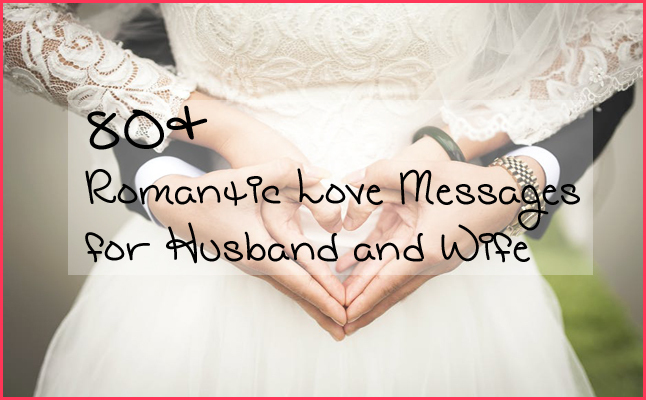 Have a look on our romantic love messages for husband and pick the one you like and send it to your husband. Love was just a word until I met you. But now I know the real value and worth of this word because now I am afraid of losing you and that feeling is none other than love. There is no doubt in it that you are the one who made my life turn over 360 degrees. Now it is all about you and you only. You are my world and I really mean it. There is no doubt that you are the man who made me a better a person and gave me chance to do all in a better way. You became the cause of the happiness in my life and you are the reason behind my smile and behind the shine and sparkle of my eyes. You really are the lucky charm of my life and my life become more beautiful because of the presence of yours in my life and yes this is true that you made my life best of all when you came to my life. I should have said it by now that I love you more than anything and anyone in this world. And I am really proud of you because you are my man. I think it is not so late to tell you that I love you and I really want to spend each and every moment of my life with you and this though made me blush that you are mine and I am yours. Your beautiful eyes made me think of angels because you are so pure and your presence made me thankful to God. I love you from the depth of my heart. I can’t count the stars and not even my love for you. And yes you are the sun of my life so always shine because you make my life happy and shiny. Yes! Why not turn your relationship’s boat towards the land of fun, romance and joy where you can never get bored of each other and always show love for each other always in unique and different manner that you and your partner find it funny and romantic at the same time. Why always hide your feelings behind heavy, polite and decent words? Why always feel shy in making first move? Why always you feel like it’s not my duty he should be the one who plans everything and surprise me with new and unique things and tell me that I am his first and last love. Why always it’s your husband’s duty or why it is always in that old same manner? Why not something funny and romantic that will make your husband’s heart filled with joy and love for you? It is not necessary to always complicate the things in fact the best thing is to show the lighter side of your relation and show a funny picture that can melt your hearts and give you a feel of laugh, smile, tears, happiness and love at the same time. 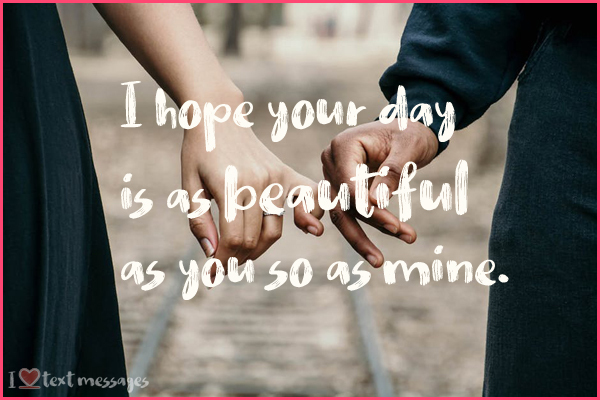 That is why we are here to present you some funny romantic love messages for husband that will really make him feel like the most important and precious person on earth and give a feel that he cannot survive without you and this smile of him is just because of you. Grab the one you like and hit send just to make your husband smile and feel love. Your sparkling eyes remind me of stars. Always make my life shiny with the beautiful eyes of yours. Because it’s just not the shine of your eyes but the light of my life as well. And when it comes to you then nothing is more important than you. You are just like my smart phone alarming but necessary! You! My love, I am at that point of love where the distance does not matter because I can feel you inside me and around me. And this point is leading me to highest level of love with you. Now please when you come sleep at couch because I want to hold the whole bed! You are the joy of my heart, happiness of my life, the love of my life, you are the first thought on my mind when I wake up, and you are the first person that I always want to see first when I open my eyes. And when I have a doubt that I will not see you I spend my whole day sleeping! Your presence makes me feel comfortable. And when I am comfortable I feel like center of universe. And when I feel this I want to love you more and more and more. By the way make me feel comfortable and please do the dishes! My life appears colorful each day, because I have an artist who paints it new every day, you make my life shiny, I love you, my handsome angel. Sometimes I feel like my life is just like a rainbow color lollypop and I want to eat it but then I realize if I it then what would I do? What if I say you are star to my dark night, which shows me the right direction to find my destiny! And yes you are my destiny! Just hold my hand because you know I am that kind of child who always got missed. You are star to my life’s sky, and you are the one who shows me the right path, always sparkle like this so I can never forget my path! But please be a straight path I feel dizziness when car goes up on a hilly path way. I never thought of such beauty and love in my life and I never expected someone to make me live life this way. Thanks to you to make me a better a person and to give light to dark streets of my life. Now please turn off the light and let me sleep in my dark room!! You have given me more than words can express or my actions can show, but that won’t stop me from saying I love you and I wish your day be great as you are and wish you a life where I am with you and we live happily ever after. Just like fairy tales! I just want to love you more and more and want to tell you that I will love you till my last breath and want to tell that you are the one whom I love you most in the world and I cannot change it at all. I don’t know why I love you this much but it is true that I love you. I love you my chickpea! Love life relationship does not seem to be complete until you make a solid commitment with the person who means a lot in your life and make you feel like center of the universe. But what’s the commitment? Yes! 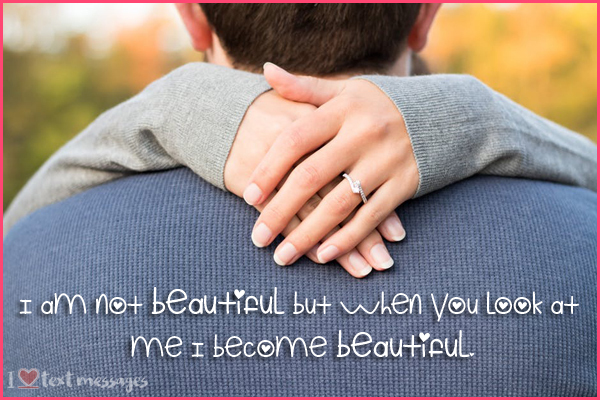 To make your girl your wife, this marriage relationships is one of the most beautiful and complete relationship that make your life loving and make her your life long life partner and make her realize that yes you are the one who is the most important and that is why I really want you to be my wife. This is the one relationship that gives your life a direction and purpose and gives your life a proper way that will lead you to a destiny that is only made for you by God. And if a woman is making your life so beautiful and changeable so why not tell her something that can totally change her mood and make her feel special. Yes romantic text message for wife is the one thing that can change her mood instantly and give her a feel like you really care for her and really love her and that is why you are trying to make her day beautiful and make her feel like the blessing in your life. That is why we present you a wide range of romantic text messages for your wife that can really give your wife a feel of cool breeze and make her feel love. Just grab the one you like and send it to your wife and make her day beautiful. Whenever I see your text a smile comes to my face. It makes me feel special when you reply me. You are more beautiful than the girl I imagined to be loved by. Your voice is as sweet as chocolate. Your presence makes it flowery everywhere. You spread colors around me. If love had a face, it must be you. Your presence is like air around me. Whatever you wear, it looks amazing on you. Or is it you who make everything beautiful? I like to see you every day. I really want to travel the world with you. My sunrise because of you, my sunsets because of you. You are as shiny as gold. Your smile makes my world shinier. How could you be so good at everything? The world is so jealous of you, while I am so proud of you. For me the most important card in the deck of cards is the queen of hearts because that represents you. In the silence of your absence, you’re the only thing I can see and hear. No person or thing can make me happier than your big smile for me. Your presence makes my world more beautiful. Whenever you look at me, I can’t look anywhere else. I have never felt so loved. It makes me feel like I am flying. My cheeks are hurting because I am smiling so much these days. Everything reminds me of you, it’s like you are everywhere. My day starts with your morning text when you are not with me. You are not just the shoulder on which I can but the strength that gives me power to face every problem. I can win everything with my one hand, provided you are holding my other hand. You have the face that reminds me of who really I am. Your voice makes me forget where I am. Your smile makes gives peace to my heart. Your presence brings best out of me. You always make me feel like I am the luckiest guy to have you. I can’t stop thinking about you. It really makes me feel happy when you are around. The smallest imperfection that you, have make you perfect; after all, it is the small thing that matter the most. I could hold you forever! Come back soon so I could hold you again. You are really a serious thief because you stole really precious thing and I think I have to report in church because you stole my heart! I guess you were an angel because you seem to have such wisdom and pure beauty that is melting my heart day and night. Every time I see you, I fall in love with you all over again and that is why I can never ever leave because my heart and soul is connected to you. Honey, you are my dream girl, and like my parents always say, never give up on your dreams and here you are as my wife looking after me and killing me with your beauty. Time spend with you is the best time of my life. I wouldn’t trade it for the world. Good day my love! 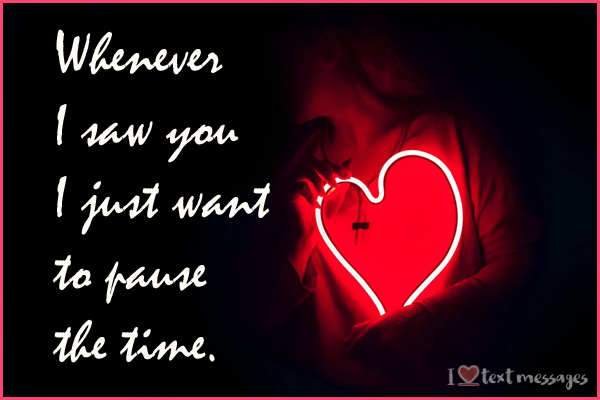 Whenever I saw you I just want to pause the time. You could have anyone in this world but you chose me and I am eternally grateful. I want to take you to a garden because I want to the flowers your beauty so they can have the idea what the real beauty is? And to tell them that look I have a real flower! Yes! Marriage turns your life into such thing where you can share each and everything you got and there is no shame in it because this is the most beautiful relation because no one is here to judge you or to pass comments but to own you in every condition and every situation. Yes! That is why it is the most beautiful and lovely relationship because it has something that really makes you feel like you can do anything in front of this person because he let you to do so. It means you can crack any kind of jokes even they are not funny but he is going to laugh because he does not judge you and so not make you feel down but always cheer you up and that is why he is being funny with you because he always make you smile with his funny gestures. Here we present you romantic funny text messages for wife so you can make her laugh and make her feel your love in such a way that she loves you back with more intensity and want your presence always around her. Pick the one you like most send it to your wife and make her feel the most special girl in this whole world. Life is never perfect. It is always full of ups and downs and it is a combination of hard and good times but you are the one who make me to look on the positive side and you are the one who really make me feel better. But I love it when you are up and I am down!! Even the most romantic place can’t make me feel like this, when I see you and my heart skips a beat. Hug me and check it yourself! I love gazing at my wife in the morning. Because the hidden sleep in those eyes make me believe in nature and miracles. Every morning when I open my eyes it’s like I am back in life with my full spirit because you are in front of my eyes and makes me feel the strength that I can do everything by just holding your hand. Please come with me and do my work pending in office!! Every sunrise gives me a new day to love you! Sweetheart. Hope you have an amazing day ahead! I would give everything up to kiss you good morning, right now. I love you my lady. I hope your day is as beautiful as you so as mine. With you, my mornings have never been better. I am always on cloud nine. And I love to spend my whole days and nights with you. The sun is up, the skies are blue! My love I’ll be thinking about you and see you soon with a bottle of vine but the problem is, that I have already drank it so we will fill water in it. Is that alright to you? It’s time to rise my angel, my paradise, my heaven. Please bring a cup of tea I am in lawn! All I need right now is my morning tea and you beside me so I can be recharged completely. And please bring some breakfast with some orange juice! Thank you! Every morning I thank to God for such a beautiful gift as my wife. Every morning I wake up to realize that my life is not ordinary, because I have a wife who is extraordinary. Now please make some extraordinary dinner! I love the way you look at me when I get back home!! Our marriage is the best proof that true love really exists and your face reminds that God really made angles for this world. I always wanted you as my wife but my heart always needed you as its life. Every morning I feel thankful for two beautiful things – my life and my girl. And my black coffee! I should be thankful to God because he put you in my life. The hardest thing that I say to you is goodbye. You are the definition of beauty in my life. You define colors in my life. When you smile it’s like rainbow around me. Beautiful lady mine! Please make some beautiful pasta!